Ekiti govt bans Fayemi from holding public office – Royal Times of Nigeria. 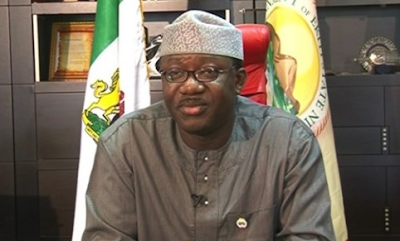 The Ekiti State Government has banned the Minister of Mines and Steel Development, Kayode Fayemi, from holding public office in the state for 10 years. The ban followed the indictment of Mr. Fayemi by a judicial commission of inquiry which probed his tenure as governor of Ekiti State between 2010 and 2014.
white paper stipulating the ban was released Monday. The state also banned Dapo Kolawole, who served as Commissioner for Finance under Mr. Fayemi. In a reaction, Mr. Fayemi dismissed the verdict of the white paper as “a joke taken too far”. He said it was “perhaps a joke of the century” that “shall not stand”. He restated his position that the inquiry by the Ayo Fayose-led government was a “witch-hunt and victimisation”. In the white paper, received by Mr. Fayose, the government also chided Messrs Fayemi and Kolawole for their refusal to appear before the commission even after the case filed at the High Court, challenging the setting of the commission, was decided in favour of the commission. The report had accused Mr. Fayemi of diverting funds meant for the construction of various projects, for which the state is now indebted. “The attention of the Media Office of the Minister of Mines and Steel Development, Dr Kayode Fayemi, has been drawn to the pre-meditated verdict of the Ekiti State Government, as contained in the white paper submitted by the panel set up by Governor Ayo Fayose to investigate the finances of the state between 2010 and 2014,” the statement signed by his media aide, Yinka Oyebode, said. “While we believe it is part of the responsibilities of the state administration to look into the finances of the state at any point in time, we are also of the belief that such must be done in a very responsible manner devoid of prejudice, witch hunting and a calculated attempt to victimise a citizen.